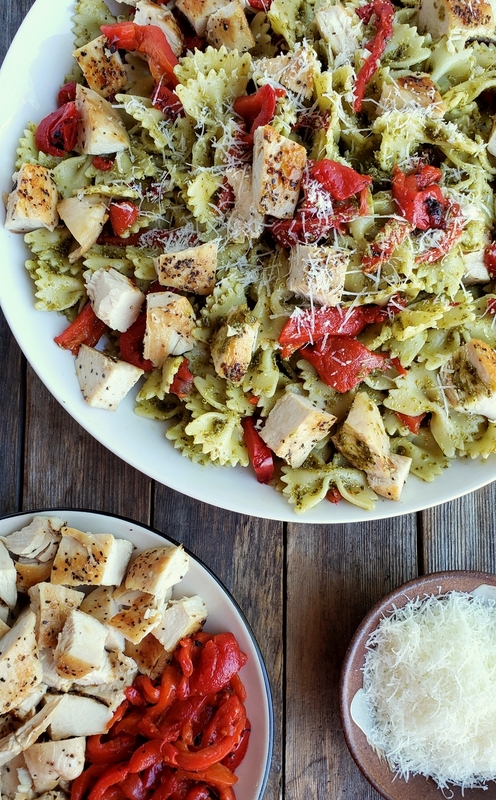 Get dinner on the table with this Quick Chicken and Pesto Pasta. It’s full of flavor and makes great leftovers for lunch. How is everyone’s summer going so far? I have been so busy and a little MIA here. Sorry. With my oldest son graduating from high school and all the other regular, end of the school year activities, May and June seemed to fly by. We also did some traveling to the east coast where my son will be attending college. It still hasn’t totally hit me that in seven short weeks we will be moving him into the dorms and leaving him three thousand miles away. While I am excited for him, I would be lying if I said this wasn’t a very bittersweet moment in parenting. Sigh. With everything going on and the heat of summer finally settling into Oregon, easy meals are the only thing I want to prepare. 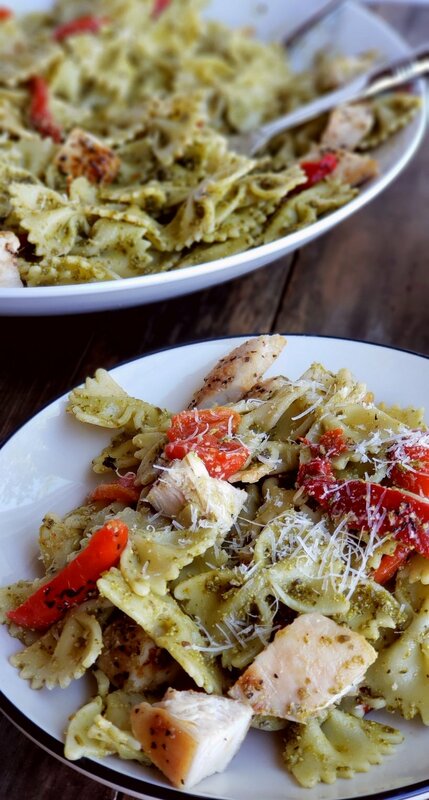 This Quick Chicken and Pesto Pasta checks all the boxes when it comes to a time-saving, but still delicious meal. And because it’s red and green, this can easily make an appearance during the holiday season for anyone celebrating Christmas. Using already prepared pesto is the key to making this meal come to together in minutes. Pick some jarred pesto up the next time you are at the market. I keep several in my fridge for last minute meals like this one. If you happen to have basil or any herbs growing out of control this time of year, this post will teach you how to make your own pesto. 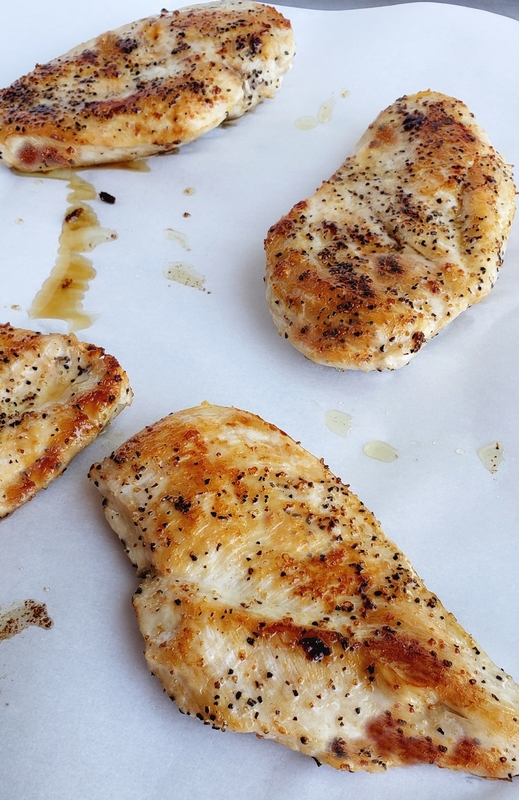 Another tip when it comes to getting this meal on the table quickly is your chicken breasts. You can either purchase thin-sliced chicken breasts or slice your boneless, skinless chicken breasts in half lengthwise. They cook much faster, so you’ll be eating much sooner, which is all we really want anyways. A jar of roasted red peppers goes a long way when it comes to adding flavor without packing on the calories. The roasted version bears little resemblance to raw, red, bell peppers as the roasting process changes them from a firm, crunchy vegetable to a velvety, soft consistency. Roasting also brings out the pepper’s natural sweetness. I also love using roasted red peppers in my Antipasto Pasta Salad recipe. It brings so much tangy deliciousness to the dish. Basically, you can’t go wrong with them, so don’t be shy when it comes to adding them to your favorite meals. This is also the perfect meal to take to the office for lunch! It holds up well and doesn’t dry out. Don’t forget the crusty bread. If you’re looking for more quick and easy summer meals, I’ve got you covered! How about these Spicy BBQ Chicken Tacos to get a jump on dinner. And these Parmesan Chicken Foil Packets are effortless summer fare. Have you ever thought about making French Dip Tortilla Roll Ups? This Spicy Easy Pad Thai is also a delicious summer meal that needs to be on your table soon. Six years ago I made these Almond Cran-Strawberry Granola Parfaits and they are seriously so awesome for a grab and go breakfast option. Eight years ago these Pork Chops with Peach-Ginger Chutney brought in all the flavors of summer at dinnertime. It’s a must during the simmer months. 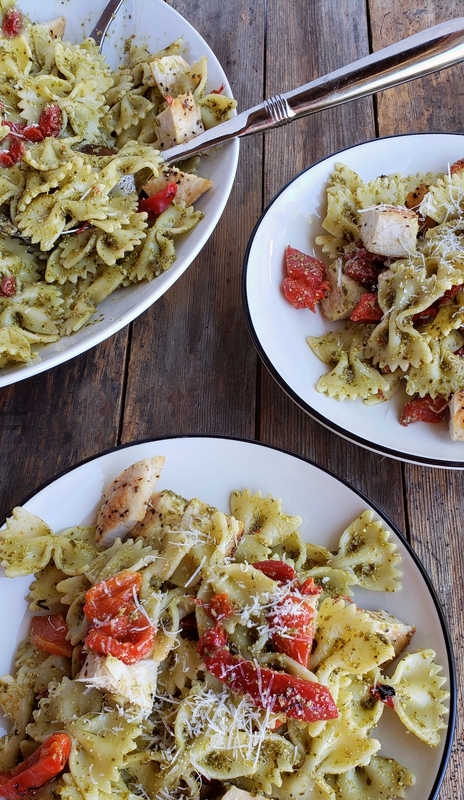 Get dinner on the table with this Quick Chicken and Pesto Pasta. It's full of flavor and makes great leftovers for lunch. Season chicken well with salt and pepper. Warm oil in a large, nonstick skillet over medium-high heat. Cook chicken until it is no longer pink inside, about 6-7 minutes per side. Let rest on a cutting board for 10 minutes and then cut into 1/2" pieces. Add bow-tie pasta to boiling water and cook until al dente according to package directions. Drain pasta and rinse with cold water. 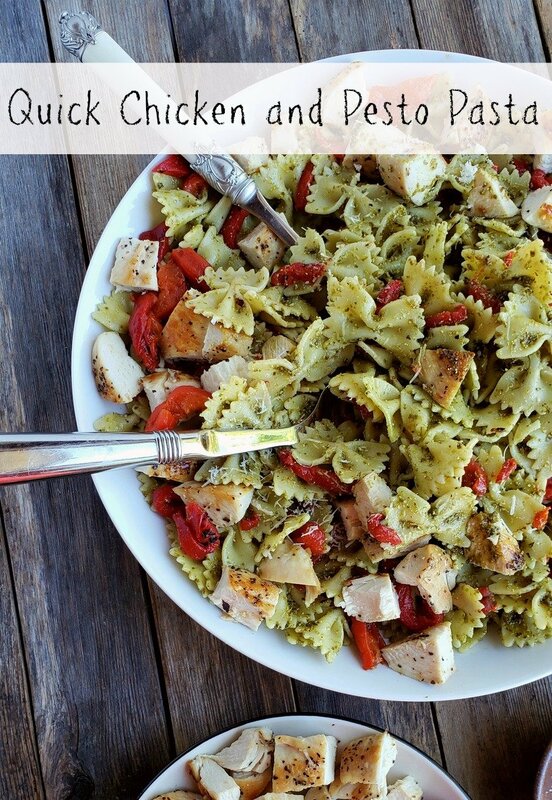 In a large bowl combine pasta and pesto. Add chicken and red pepper. Toss and season to taste with salt and pepper. Sprinkle each serving with Parmesan cheese. Thank you, we’re excited for him. I bet this would make a great cold salad too! Yep, all leftovers get stored in the fridge and it’s perfect cold or room temp. I was watering the plants on my balcony yesterday and noticed I had more basil than I knew what to do with. I thought I needed to make some pesto soon, so thanks for your inspiration! Throwing some chicken and bowties in there is a perfect solution. Your son graduated from high school? Yikes! I feel old. I have been reading your blog all these years and thus watching your son grow up from a little tyke through your blog. Well, congrats to him and good luck in college! How awesome! And yes…he was 8-ish when I started my blog 10 years ago. Time sure does fly. Thanks for hanging out all these years. A perfect busy day meal! This is now a favorite to bring to the office all week for lunch. So good. I made this and it was so, so good! I love how easy this is, and yet there’s so much flavor. Perfect picnic food! It is perfect picnic food. 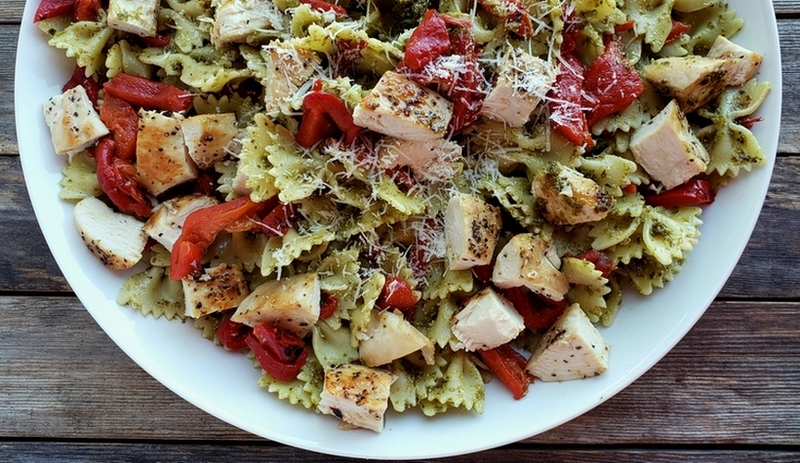 Oh I always need ideas for using chicken breasts creatively and this yummy pasta recipe fits the bill perfectly. So great for this time of the year too. YUM! I could eat this all Summer and never get tired of it. Such a great dish for a potluck!